Steel Rolling Warehouse Ladders are finally an easy and safe solution for reaching products on high shelves. 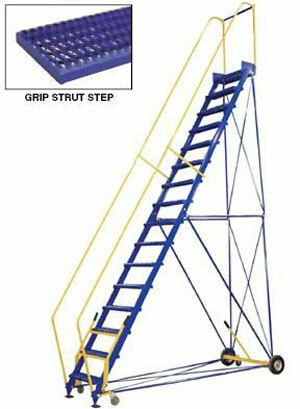 Each ladder includes an exclusive lockable safety gate that keeps children and unauthorized personnel off the ladder. Pushing the gate forward will raise the casters off the floor and allow for safe access to the ladder. Pulling the gate backwards will lower the casters to the floor, prohibit access to the ladder and allow the ladder to be moved. Each ladder is rated at 350 lbs. capacity. The standard climb angle is 58° (contact factory for pricing on optional 50° Easy-Climb angle). The handrail height is 30" from the steps and 34" around the top platform that includes a 4" toeboard. Each step is 24" wide by 7" deep. Front wheels are 10" diameter. Side frame is constructed from heavy-duty rectangular tubing that offers maximum strength. Unique two-piece design allows ladder to separate for shipping and storage. Welded steel construction with powder coat finish. Manufactured in compliance with OSHA and ANSI A14.7 standards. See chart below for specs. * Please select apporpriate option when ordering.